The Boeing 747-100 was the first production version of the epochal large-body aircraft, entering into airline service in 1970. It’s iconic bulging forward fuselage contained a unique innovation in modern jet travel, a two level first-class cabin and flight deck. 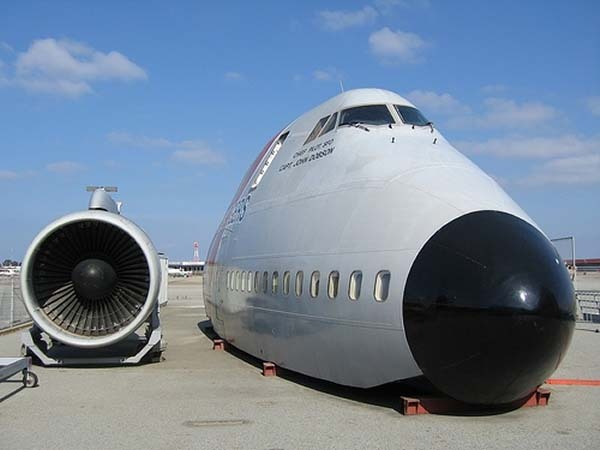 The museum’s Boeing 747-136, serial #20269 with the registration number of G-AWNG, first flew in March 1971. She flew her distinguished life in British Airways colors and was Christened Rutland Waters after a lake in central England. This model 136, meaning she was powered with Pratt & Whitney engines, served for 27 years. 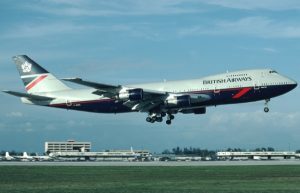 Her final service flight was from New York’s Kennedy Airport to London’s Heathrow Airport. Her last flight ended her illustrious career at Roswell, New Mexico in December 1998. Known as NG, (to those that flew her) our aircraft flew 106,622 hours and made 21,639 landings before being sold to ARR Corporation in Roswell for salvage on December 14, 1998. That averages over twelve hours a day of aircraft utilization during the life of the aircraft. 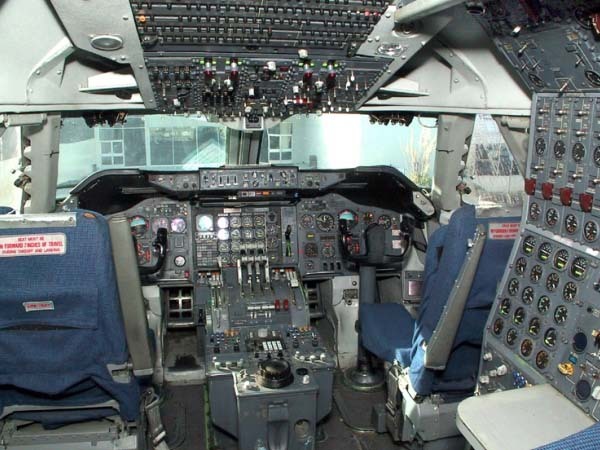 The museum had been searching for a 747 cockpit section for display when AAR made a very generous donation of an intact one F.O.B. Roswell, New Mexico. The museum had the responsibility to engineer, supervise, and pay all transportation costs to San Carlos, California. The forward 45 feet of the upper 2/3 of the fuselage was cut vertically and then horizontally into two sections. 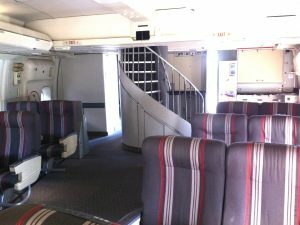 The smaller upper cockpit section was nested inside the larger lower passenger section for transport. An oversized truck load (22 feet wide) presented numerous transportation challenges through 3 states. Many logistical problems had to be over come in getting the aircraft to the Hiller Aviation Museum. Much of the credit goes to the genius of the disassemble, rigging and moving crews, the combined efforts of local law enforcement; state agencies; Cal-Trans and CHP for their support and cooperation in helping to move the 747 from New Mexico to San Carlos, California. Two years of daily restoration work totaling some 15 thousand hours has gone into assembling this one of a kind fantastic exhibit. Most of the expertise and labor for the reassembly was donated by United Airlines, and we thank United for their generous support of time and materials. The combined efforts of our volunteer restoration team, museum staff, United Airline mechanics and aircraft experts has turned this salvaged aircraft into a premier exhibit that will be preserved for posterity. 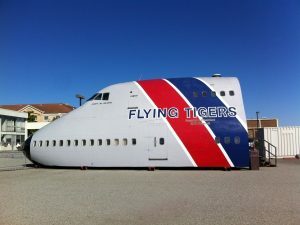 The major benefactor of this project, retired Flying Tiger Captain Al Silver requested the aircraft be painted with the Flying Tiger colors and logo in honor of the company that employed him for 35 years. Enjoy your visit to our 747 exhibit, a tribute to all the men and women of 747 series flight and ground crews around the world. Please take the time to explore the flight deck, and see where these dedicated flight crewmembers go to work every day in an aircraft serving the public for over 30 years.